Gerard Dunning was awarded his PhD at TU Delft on Friday 22 April for his help with developing a robotic arm-support aid for Duchenne patients. Together with University of Twente, the VUmc and Radboud UMC, Dunning worked on the development of the A-Gear – a robotic arm-support to assist boys from the age of 10 who are suffering from Duchenne muscular dystrophy in their daily activities. 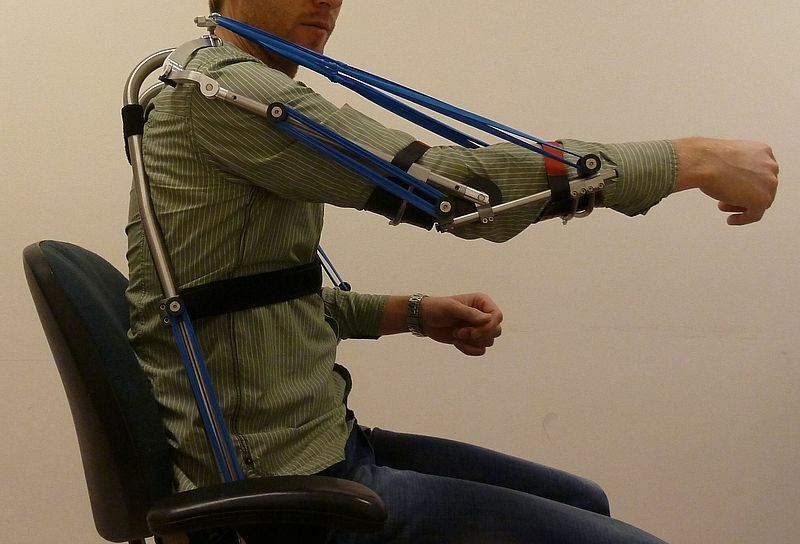 They created a prototype for a personal device, which can be worn under clothing to support the arm to function independently during everyday activities. Young Duchenne patients requested a device like this to be developed because the currently available robotic arm-supports are often too heavy and noticeable. Dunning received extensive help during the test phases, where the wishes of the patients were incorporate where possible. “This is the most important aspect and certainly one of the main reasons it has been a success.” says Dunning. The developed prototype was evaluated by young Duchenne patients. Despite Dunning being finished with his research, intensive testing for the arm will continue so that it can be certified and put on the market. Steps to take the device beyond the prototype stage are already being explored.